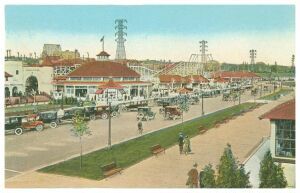 The name "Sunnyside" had been used to denote a beach and its surrounding area for 70-plus years before the amusement park opened. It may have been coined by George Howard, a prominent citizen. In 1848 he had built a home overlooking the shore on the sunny side of a hill. He might have named it "Sunnyside Villa" or "Sunnyside Farm". The other possibility is that subsequent owner George Cheney, named it after American author Washington Irving's home in Tarrytown, New York. Regardless, the villa would eventually become part of St. Joseph's Hospital and be demolished in 1945. It sat on land which is now the parking garage for The St. Joseph's Medical Centre in Toronto. After the Howard home was built, the surrounding area then became a preferred one in which to erect new homes, and as the beach area became more popular, The Ocean House Hotel was built in 1884. It came to house a Bake-Rite shop, Laura Secord Candy Shop, Tamblyn Drugstore, and a United Cigar Store. Some of these early Canadian businesses would survive into the present to become country-wide chain stores. The structure itself still stands at the corner of present-day Queen Street and Roncesvalles Avenue overlooking an area that would generally become the amusement park and specifically, The Boulevard Club's location. This view looks west from over top of The CNE grounds toward Humber Bay. Sunnyside was situated along the inner curve of that bay (Top Right). To the left is Lake Ontario, with Toronto proper located out of frame, right. Today, Ontario Place occupies roughly the Center Left area and juts out into the water, out of frame left. In 1888, Sunnyside became part of Toronto and by the 1890s, the population was large enough to warrant the building of a streetcar service to the district. This was extended by new owners in 1893. One promotion started in that decade was the bathing-car service offered free to kids in the summer. They would pick up any children with bathing suits and towels and transport them at no charge to & from the beach area west of the main part of Toronto. Sunnyside was included from at least 1922, if not before. This service would continue until August of 1950 when lack of patronage caused it to be discontinued. 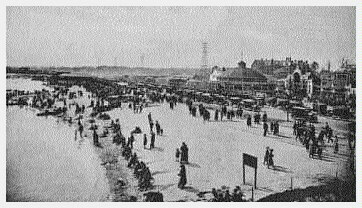 Thanks in part to the tram lines, the beach became a more popular summertime attraction, so a boardwalk was constructed along which the tradition of Easter Parades was started. 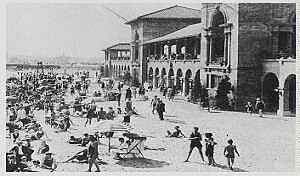 A number of private establishments were then built over the next few decades including Pauline Meyer's Banquet and Refreshment Pavilion (Restaurant), Maw's Boathouse, and also changing booths to service those whom the beach attracted. This was taken before the development of the amusement park just beyond this location. It shows the old boardwalk along Lake Shore Road. In the distance is Meyer's Restaurant. The photo is at a time before the hydro-electric transmission lines and towers were installed just offshore starting in 1910. The water area to the right would eventually become filled in as part of the land reclamation project. Meyer's would be succeeded by The Pavilion Restaurant in 1917, and because of land reclamation, become several hundred metres inland. This closer photo of the restaurant was taken near the bottom of today's Parkside Drive. The waterfront enticed canoeists. 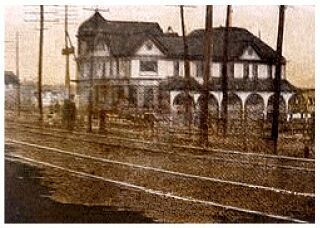 Beginning in 1905 they first met at Meyer's, but in 1908 they opened their own clubhouse near the south end of present-day Indian Road as The "Parkdale Canoe Club" (PCC). This club was built on pilings at the end of a boardwalk just over 20 metres from shore. It unfortunately burned in 1912, but a new one was constructed at the end of a pier farther east of the 1908 location. As bad luck would have it, this new building burned before it was even completed. Another was built on the same pier in 1915. The structure had spectators' balconies, and with the building being so far out into the water, it afforded them an excellent view of the many regattas hosted by the club. A city land reclamation project eventually caused the building to end up close to shore so the pier ultimately became unnecessary. This third two-story club house, despite having a tile roof, burned in yet another fire in 1923. A fourth and final structure was erected in 1924 of which the name later changed to The "Boulevard Club". Despite numerous alterations over the years, it still exists just east of present-day Marine Drive. The letters "P.C.C" are still visible near the entrance. 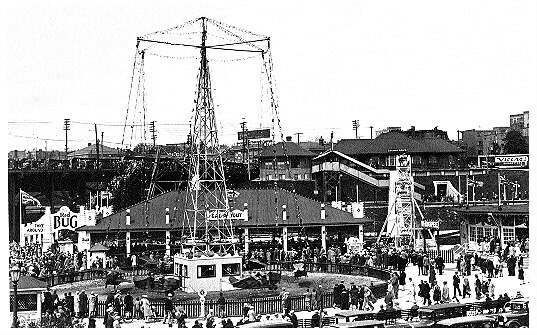 The amusement park's genesis at Sunnyside began in 1911 after the formation of The Toronto Harbour Commission (T.H.C.) as a way to have master control of the waterfront in and near Toronto. One of its plans was to establish an amusement area and beach somewhere west of Victoria Park, which had closed in 1906. Since the Sunnyside area was already popular, this was deemed the logical place to do so. Another factor favouring this area was the demolition of the former Parkdale pumping station, around which had established a popular swimming area. This had come about after a 1910 project saw the re-grading of the railroad right-of-way to eliminate level crossings by lowering the tracks and building road overpasses. The pumping station was in the way of an overpass and was removed. Locals requested the T.H.C. establish a new bathing station, and so 1914 saw new bath house facilities erected by Emil Brooker, which included a water slide. The commission also established a free beach near Brooker's operation for those unable to afford the fee. It's not known how long these areas lasted after competition began from The Sunnyside Bathing Pavilion, which would open in 1922. By 1917, The Sunnyside Pavilion Restaurant had commenced business on the former site of Meyer's at the corner of Lake Shore Boulevard and Parkside Drive. Although only one story, as compared to Meyer's two, there were just about floor-to-ceiling windows, two gardens joined by a covered walkway, and two dining rooms - one with a sunken dance floor and one with a large fireplace. The gardens were divided into terraced sections and decorated in flowers and fountains, with both being illuminated for night patrons. Also included was a fancy ice cream parlour with a long, L-shaped counter. The club's dining and dancing would prove so popular that the structure would double in size in 1920. It then came to have two dining/dancing rooms: The Blue Room held 400 diners and 350 dancers, while The Rose Room had space for 300 diners and 300 dancers. This capacity would be bolstered in the summer months by the garden area, which may have been known as The "Crystal Terrace". That name appears on a sign on the club's roof sometime after 1936. The restaurant became the place and many social functions were held there. It even became the headquarters for The West Toronto Kiwanis Club. 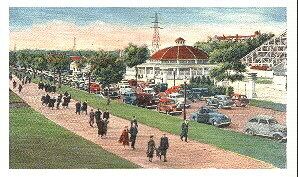 The Pavilion would later be known as "Club Esquire" (1936 - 1939) and "Club Top Hat" (1939 - 1956). 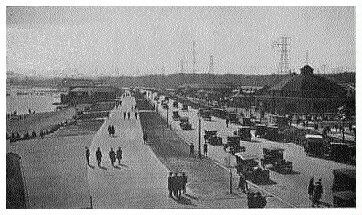 Although The Great War had slowed progress, by the early 1920s new wharves, about six kilometres of breakwalls, additional parklands, and more streets had been developed by The Commission in the area of Humber Bay, west of the city proper. Land had also been reclaimed by dredging the bottom of Lake Ontario and placing over 3 million cubic metres of fill along the shoreline. It eventually would grow to about 600 hectares of reclaimed land. The view looks west. It was likely taken from the roof of The Pavilion Restaurant which is located here on the former site of Meyer's. Shown is some of the reclaimed land. Note the power line tower just visible at Upper Right. Lake Ontario once lapped at its base before the land fill operation. The new street is Lake Shore Boulevard, with Parkside Drive leading out of frame, Lower Right. In the distance, at Center Top, is the new Bathing Pavilion (discussed later on). At Center Left, may be seen the edge of the bleachers for the Natatorium swimming pool. The skeletal structure rising above and behind them is the pool's diving tower. The presence of this pool dates this photo at 1925 or later. In front of the pool, and curving into the distance past the bathing pavilion, is the new boardwalk (see below). The breakwater line is visible a short distance out into the lake. The total initial park area was 53 hectares, but that increased over the years as more land was reclaimed from Lake Ontario so that the park eventually spanned a 3-kilometre strip along the waterfront. 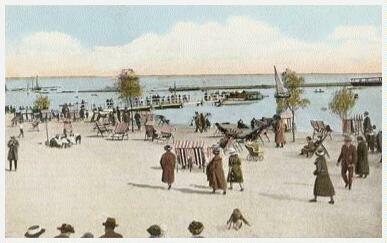 The Harbour Commission also created a new beach and bathing pavilion which was to be the focal point of the park. The 4500 square-metre Sunnyside Bathing Pavilion was designed by A.H. Chapman and had swimming areas with diving platforms, flotation devices, and water slides - all patrolled by lifeguards. Swimming instruction was also available for the novice. For night swimming, the beach and water were floodlit. Inside the pavilion were available hair dressers and electric dryers, manicurists, showers, suit and towel rentals, and 7,700 lockers. For safety, there was a First Aid Room attended by a trained nurse. Those not swimming were provided with open-walled, terraced gardens on the second level in between, and outside of, two main towers of the pavilion. The center one was covered. Patrons were served refreshments and entertained with an orchestra. At night a dance area was provided for more formal recreation. This pavilion and facilities cost $300,000 to construct. So much topsoil and sod were needed to dress the new property that The Toronto Harbour Commission bought a 39-hectare farm from which to get the 10,000 cubic metres of required material. Here is the lake-side view of the bathing pavilion. Shown are the central two towers. The terraces to either side extend out of frame, with each ending in another tower. Games for the new area included "Balloon Race", "Coney Racer", Figure 8", "Kentucky Derby", "Monkee Racer", and "Torpedo Race", plus a bowling alley, fish pond, and shooting gallery. There were also ten food and drink outlets. Other concessions went to beach chairs, boat rentals, guess-your-weight stands, a telescope operator, and something called a "silhouette stand". This may have been a portrait concession where patrons had likenesses of their heads done in a silhouette motif. Here is The Aero Swing, (a Traver Seaplane De Luxe) in action, with Dean's Boathouse in the background. To the left, out of frame, would be erected The Derby Racer the following season. The park's opening ceremonies were held at the new bathing pavilion 6 PM Wednesday, June 28, 1922 and thousands attended "Toronto's Lake Shore Playground" as the ads of the time stated. Newly elected mayor, Alfred McGuire, cut the ribbon with attending officials including previous mayor Tom Church, T.H.C. commissioners R. Horne Smith and Edward Cousins, and city aldermen and women. Band concerts with The Queen's Own Band and 48th Highlanders were scheduled before and after the ceremony. A banquet was held afterwards, as well. This wide-angle photo depicts the eastern end of amusement area as seen from above. It shows The Flyer roller coaster at Upper Left through Center Top. At Upper Left are three concession buildings. To the right of that is The Dutch Mill with its taller central structure. The large round building houses the Carousel. Slightly back, and to the right from that is the coaster entrance. To its right and forward are more concession buildings. The round area with the central tower is for The Aero Swing. The next round structure to the right of that is for The Derby Racer, and the little building to its right (at the frame's right edge) is a water pumping station. At the water's edge are Dean's Boathouse/Palais Royale (Center Bottom) and at Center Left is the Merrymakers Stage. Note the covered pedestrian walkway at the extreme Top Right. It allows access to Sunnyside from the railway station. Its roof may just be seen at the photo's top edge. (See the "Midway, East Side" photo, farther on, for a closer view.) The high tension wire tower is also to be noted. Before land reclamation it was actually off shore, out into the lake. A dance club called The Palais Royale opened in 1922. For a time, the owner, Walter Dean also housed a boat-building factory there which had moved from a nearby smaller facility. He was initially quite successful, especially with his "Sunnyside Torpedo" canoe model, but it eventually went out of business and the entire building became a night club. This building still exists today and has been completely refurbished. This is how the club looked by 1940. The house band at the time was Ellis McLintock. In the foreground is the wooden boardwalk with a weigh scale at Center Bottom. To the left is the Miniature Golf course. Note the windmill replica of the Dutch Mill attraction. By this time, the Dutch Mill itself had been gone from the park for about a decade, but the golf concession kept the replica as part of its course. Here is a closer view of the miniature golf course. It is to the left of the above photo and a year earlier. In the background across the street, is the Downyflake Donut Shop. 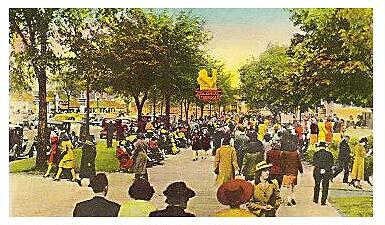 Also in 1922, was erected a bandstand on the landward side of Dean's. 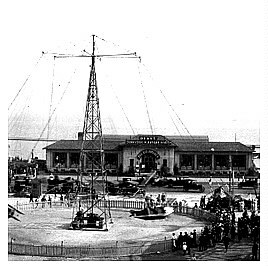 It was later moved out onto the lake at the end of a pier so as to not be interfered with by music from The "Derby Racer" (installed in 1924). The land reclamation mentioned above would eventually meet the bandstand's new location until it was no longer on a pier, but again surrounded by dry land. Part of this was spurred by high 1929 lake levels which had washed much of the beach away at Sunnyside. When the waterfront was restored, an additional expanse of sand was laid out into the lake that included the area around the bandstand. In 1923 or 24, a dark ride or walk-thru called The "Dutch Mill" opened. Little has surfaced on this, so no manufacturer is known, nor what was inside. The date is in contention because although one source says it opened in 1923, in a winter photo (shown farther on) it appears to be under construction. The problem with this is that The "Flyer" coaster, which opened in 1923, is in the picture and it appears to be complete. Considering that the ride is complete, yet is covered with snow, it's likely to be the winter of 1923/24 rather than 1922/23. The conclusion is that The "Dutch Mill" was built in the winter of 1923/24 for the 1924 season. Now, there is the possibility that The "Flyer" was completed in the late winter/early spring of 1923 and that a late snowfall covered everything, thus both opened in 1923, and sources are correct. Otherwise, The "Dutch Mill" must have opened in 1924. Finally, there is the possibility that the photo was taken much later and that The "Mill" was simply undergoing renovations. Thus, the photo is actually showing partial de-construction. There is no definite date as to when this attraction was removed. However, it is not in the "Flyer" reconstruction photo (shown farther on), taken in the winter of 1931/32. So it was removed some time before that - perhaps at the close of the 1931 season to make room for the expansion of the roller coaster. 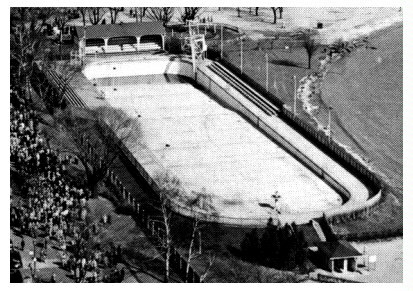 This photo was likely taken from the diving tower or bleacher seating of the swimming pool (described farther on). It is near the western end of Sunnyside and looks east. The foreground shows The "Poney Track" and beach area with picnic tables and playground equipment. The small walkway leading out into the lake at Upper Right goes to The Bandstand. 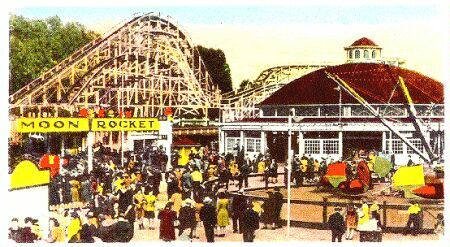 In the background may just be seen the pre-modified "Flyer" roller coaster and the carousel building (Center Top). The red-roofed building (Center & Center Left) is not yet identified but may be The "Sunnyside Pavilion", not to be confused with The Pavilion Restaurant or Bathing Pavilion. Note the row of power line towers silhouetted against the skyline. Before land reclamation, the water's edge was beyond them to the left. 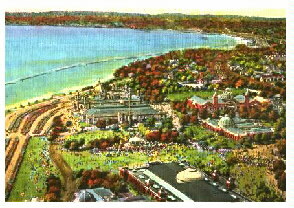 This hand-tinted postcard shows the park from across Lake Shore Boulevard and looking east. In the foreground is the boardwalk. In the park may be seen the carousel building and Flyer roller coaster behind. To the left of the carousel is the entrance to The Dutch Mill. 1923 saw John Miller's "Flyer" roller coaster open. Miller had designed many roller coasters in The United States and Canada, as well as structures in England. In fact, Miller built Blackpool's "Big Dipper" the same year as Sunnyside's "Flyer" and it still operates today. Miller was selected for these credentials, plus he had constructed attractions at an earlier Toronto amusement park called Hanlan's Point. The "Flyer" may have been erected by Harry Baker, but it's not known for sure because Miller and Baker ended their partnership in 1923. Snow blankets The "Flyer" in this off-season photo. Seen Center Top is The "Dutch Mill" (apparently under construction - see previously in the text). Left of that is the domed roof of the carousel building. Center Left shows a double-down drop, seen below a background power line tower. Note the horseshoe tunnelled section at Center Bottom, fore and center ground. Way in the background to the right of the Upper Left photo section may just been made out a worker. He is on top of the lift hill above & beyond a snow-covered roof. Perhaps it is John Miller, himself! The ride used four 3-bench cars running on a double out-&-back layout which included a curved, tunnelled section. It's not known how many trains were run. The advertising of the time stated that it had the `dippiest dips on the continent', one of which was a double-down. The train has just left the lift (at left). It is headed towards the first turn-around and a shallow drop, where upon it will run on the track visible here by looking through the foreground structure. Here is a lower-angle view of the top of the lift hill and track of the first curve. Part of the mechanism for the lift chain may be seen in the structure under the lift hill at Upper Left. In the foreground are Toronto Transit buses of the era. The Aero Swing tower may be seen in the background at Center Right. In 1932/33, Miller redesigned the ride to attain more speed by increasing the lift hill height and steepening and deepening the drops. The coaster was almost completely disassembled, as seen below. In the new version there was again at least one double-down, and photos show the lift hill apparently placed elsewhere on the ride. It also looks as if the direction was reversed, as well. Exaggerations of the time claimed the ride achieved the equivalent of over 90 km/h on the home stretch. This redesign may have been prompted by The Canadian National Exhibition which was not far from Sunnyside. It's possible that "Krug's Flyer" at The CNE was modified to produce more thrills in 1932, and may have been renamed the "Exhibition Flyer". (It's not entirely clear if these were the same or different rides. Some sources suggest that the two CNE "Flyer" coasters were separate rides, but it's just too coincidental, hence the speculation here. 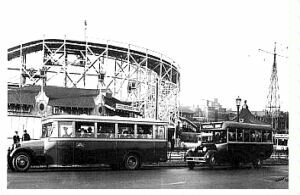 (Note that Krug's ride should not be confused with the later McKee/Davis coaster of the same name that was installed at The CNE in 1953 and torn down in June of 1992.) To keep up with the competition, Sunnyside may have requested improvements to their own coaster. Notice in between and farther back from the two buildings are the uprights of the coaster structure with no cross beams or track. To Center Right is part of the old, and some of the new, construction. In front of the concession and carousel buildings are materials from the old design and possibly some new for the coaster rebuild. The small stand in front of the carousel is one of the park's many food outlets. Many sports came to be available such as archery, bowling, lacrosse, tennis, and for a short time beginning in 1924, dog racing. Softball was played at the Sunnyside Ball Stadium which was erected in 1924 next to The Parkdale Canoe Club - with no seating! Bleachers were installed in 1925 and expanded in 1926, along with the addition of lights to allow night games. It hosted mainly women's competitions, of which there were eventually 4 leagues. The "Derby Racer" opened in 1924. It was a unique, enclosed carousel ride. Developed during World War I by Thomas Prior and Canadian-born Fred Church, it consisted of 40 horses situated four abreast around a circular platform turntable, 22 metres in diameter. Each horse was supported only from below on a single pipe which was able to move back & forth within a slot in the turntable. The mechanism consisted of a series of cables, pulleys, cams, and runners. As the ride started, music played from a band organ. Each horse remained stationary in its slot while the platform turned; so it was like a regular carousel. When the ride got up to speed, the operator would pull a lever and each horse would then additionally move back and forth within its slot. This movement would vary during the ride and also differ for each "race". Any horse in each group of four might "win" at the end of the ride. In the year of its opening, "Derby" rides were 10 cents each or four for 25 cents. Each winner would receive a free ticket to ride again. That pricing likely continued into the 1930s. Apparently Sunnyside Park controlled the rights to this ride, and no others were ever sold in Canada. Perhaps they wanted it that way, especially to keep the nearby Canadian National Exhibition competition at bay. Still, one would think they'd have arranged sales to other non-competing parks in Canada. Ironically, the ride would end up at The CNE after Sunnyside closed. Here is the carousel building on a busy afternoon at the park. At Center Top just peaking above the roof, may be seen The "Dutch Mill". To the left are concession buildings. On the right is the "Flyer" track. The arched facade is believed to be the coaster's entrance. This old photo shows more of the boardwalk across from the carousel building. The photo was likely taken from The Palais Royale. Here is a similar view but showing the beach area between the water and the boardwalk. Both this and the above photo drive home the amount of land reclaimed when one considers that the water once lapped the power towers in the far background. Although there was a lake bathing area and pavilion, it was not being patronized as well as expected due to a couple of cool summers. So a $75,000 heated pool facility opened on the beach area east of the bathing pavilion on July 29, 1925. The new facility went under the name of "Sunnyside Outdoor Natatorium" but eventually became known as The Sunnyside "Tank". It was the largest outdoor pool in the world at 2100 square metres. At about 92 metres long, it just about equalled the length of a Canadian football field of 100 metres. It contained 3.4 million litres of water and could hold 2000 swimmers at once! The pool sloped down from about a metre at the shallow end to diving depth at the opposite end. Located there in one corner was a tower with two levels of diving boards. On either side of the pool near the diving end were open bleachers. Located right at that end was a larger array of spectator seating of about a dozen tiers. This end set would receive a roof by the late 1940s. It's not clear if this seating was there upon opening, because one early photo seems to show no seating at that end of the pool. Here's a hand-tinted view of the swimming pool at Sunnyside looking east from the bathing pavilion. Water was drawn from the pool, filtered and heated to 20 degrees, then reintroduced into the pool. The "Tank" extended the swimming season (even during years with warm summers), by providing swimming activities when the lake was too cool. 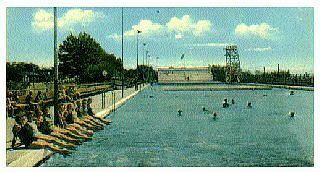 This shot shows the spectator seating (pre-roof) and diving tower at the far end (Center) and a few swimmers in the pool. Along the left are a row of female swimmers posing for the photographer. This view gives a good representation of the expanse of this facility. A separate children's pool was eventually provided as well (installed before 1932). Fees were 10 cents for children and 35 cents for adults. Season passes were available for $2 and $6. Boating and beach chairs continued to be made available at the lake, with swimmers congregating there during the warmest times, as well as at the pools. This aerial photo was taken early in the season before the pool was flooded. Note how its enormous size dwarfs the people on the sidewalk to its left. At Bottom Right is the pool's entrance. The little building houses spray showers through which all swimmers had to pass before entering the pool. It was installed sometime in the 1930s or 40s because it does not appear in earlier images of the pool. Note the spectator seating at Upper Right and at the pool's far end. That end section has a roof now. Also, notice at Center Right and Upper Right, how close the pool is to the lake. 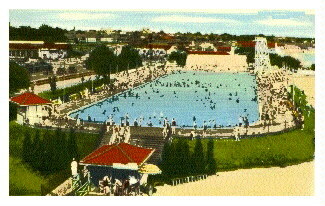 This large pool is still at Sunnyside Beach, roughly situated below the foot of Parkside Drive and next to a restored bathing pavilion. Charges to use it have been dropped. Neil Goodwill, now of Port Dover, Ontario, used to attend Sunnyside in the 1940s and 50s. He says: "Unfortunately, those who could not afford the amusements and wished to swim at no cost, had to swim in the lake. Some drowned in those days because there were no lifeguards there, as I remember. The distance to the breakwall was four or five - maybe six metres because the beach jutted out at this point towards the breakwall. It was a challenge to youngsters by themselves to breech this distance with a strong dog paddle and become the hero for a day. It was dangerous and is prohibited today." Patrons stroll the beach while boaters enjoy the lake between the shore and the breakwater. 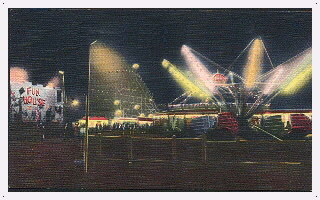 The park promoted entertainment in the 1920s and 30s that ranged from Ballet Canadienne, and Ukraine Song and Dance, through dancing bears and trained seals, escape artists and magicians, female impersonators, and fireworks, to circus acrobats, pole-sitters, high-wire acts, various vaudeville performers, and community sing-alongs. Contests held were held for babies, dancers, dish washing, red-haired, freckle-faced kids, dogs in doll's clothes, and beauty contests. The Miss Toronto Beauty Pageant started here in 1926 and ran until taken over by The Toronto Police Department in 1937, when it moved to the CNE grounds Grandstand. At the right is the entrance to Fun*Land. It was located at the eastern end of "Flyer" roller coaster. The signs read in part "Let's All Go In. 1000 Laughs". Admission was 15 cents at that time. The refreshment stand at the left sold Sunnyside "Red Hots" and O'Keefe's Dry Ginger Ale. The background structure is part of the roller coaster. Other entertainment at the park in the 1920s and 30s consisted of the many bands of the time, aerial displays including parachutists and wing walkers, and most unfortunately by today's standards: the Boat Burnings. This consisted of old ferries and other vessels were burned at night as crowd drawers to the park. 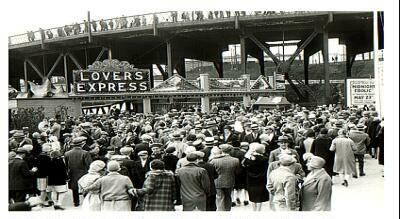 An attraction called "Lovers Express" has shown up in one photograph from the late 1920s or early 30s. It's unknown what it was, but it was located almost underneath the traffic bridge which had caused the removal of the old Parkdale Pumping Station, as was noted near the start of this article. It did not last many seasons because this attraction does not show up in the 1932 Sunnyside yearbook. People on the overhead traffic bridge look down on this spring day crowd. It is unknown what this attraction was about, but people seemed to like it. The sign at the right says, in part: "Midnight Frolic, May 23". The Depression saw many businesses go under which included ferry companies. These boats were often bought by parks to burn as an attraction. Today, of course, we are much more interested in preserving the past. This is evidenced in part by the website you are presently visiting and by the efforts of various groups to restore park ferries that serviced Hanlan's Point and Boblo Island. In 1927, the Palace Pier project was started west of Sunnyside Park at The Humber River outlet. It occupied the area where Crow's Beach and Hotel had stood only a couple of decades before. This project was part of The Provincial Improvement Corporation plan and originally called for a $1.25 million, 800-metre long pier with a bandstand, dance hall, theater, and "Palace of Fun". The Depression saw a stop to the project by 1932 with only about 100 metres of pier and an auditorium being completed. It took the lawyers nine years to sort out, but in 1941 the auditorium opened as The Strathcona Roller Rink, and that became The Queensway Ballroom in 1943. This reverted to the Palace Pier Dance Hall soon after and big bands played there throughout the 1940s and early 1950s. This is the mouth of the Humber River. Sunnyside amusement park is gone, but was located farther down those railroad tracks out of frame, top. At the right, stands the Palace Pier. This was taken about five years before it burned. Neil Goodwill, now of Port Dover, Ontario, attended the pier often in the 1940s and 50s, He remembers: "I had been to Palace Pier most Sundays in the late 1940s and early 50s to see entertainment. They used to feature a comedian named "Doug Romaine" who would hold us in stitches. It was also an outlet for boxing. I met up with boyhood chum, George Strong, in later years. He even said he boxed there, and knowing George, he must have been good." After that time, the Pier became an assembly place for religious meetings, boxing matches and graduation formals. The auditorium burned in January of 1963 but the Pier may still be seen today next to two high-rise condominiums: Palace Place. A ride introduced to the park, likely in the late 1920s, was The "Custer Car". These were battery-operated, drive-yourself cars from The Traver Engineering Company. A typical setup, as described in the company's 1927 catalog, was ten cars, 20 batteries, 2 charging units, and 7 track trips (likely sensors). Total cost was under $4,000, but up to another $3,000 could be spent on the track, station, and garage. The name used by the park for this attraction seems to be "Auto Ride", which appears in late 1940s photos. However, the manufacturer's name of "Custer" was used from at least the ride's introduction up to 1932. It appears in a 1932 Sunnyside brochure under that name. There is some confusion between this attraction and The "Red Bug". The latter also appears to be a U-Drive car ride, so the park may have had two similar models at the same time. Rides here from left to right are The Red Bug, Gad-A-Bout, Whoopee, and in the foreground, The Aero Swing. The building to the far right houses The Derby Racer. Above and behind The Whoopee is the Sunnyside Rail Station. 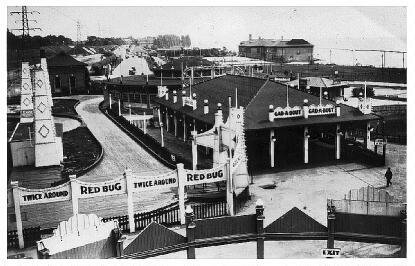 The staircase leading from it and the other one above and behind The Red Bug, were the major pedestrian entrances to the amusement area at the park. Note the weigh scale, Center Bottom, and the presence of numerous British Union Jack flags. The Gad-A-Bout and Red Bug are seen more clearly here in this off-season photo. Behind, lie The Whoopee\Swooper and the Derby Racer building. Partly out of frame to the right is the enclosure for the Aero Swing, and in the far background at Upper Right is Dean's Boathouse/Palais Royale. The attraction in the foreground with the "Exit" sign, appears to be Lovers Express. This photo was taken after the move. Note that the ride sign now reads "Swooper" instead of "Whoopee". "Glider" (Traver?) Possibly a renamed "Aero Swing"
"Swooper" (Sellner) Installed in 1929 as The "Whoopee"
but the name was changed after an accident. Plus french fries, peanuts, and popcorn outlets. Note that The "Dutch Mill" listing above is likely wrong. It is believed that attraction had been removed by the 1932 season. However, there is a possibility that it was moved or reduced in size and may have later become "Spook Castle" sometime in the 1930s or 40s. Proof of at least a size reduction is that the entrance building to The "Dutch Mill" is not seen in the winter "Flyer" rebuild photo, farther back, but an earlier photo (below) shows it. This shows the concession buildings as they looked in the park's opening season and for a few years afterward. At the left is the edge of a stand-alone Vernor's Ginger Ale outlet. It also sold Hires Root Beer. Another stand-alone concession building is at the right in front of the carousel building. Note the Dutch Mill above the main buildings between the hydro towers. To the far right is its main entrance seen between the concession buildings. All the buildings are outlined in light bulbs. Here are the concession buildings as they appeared after some additions. See how different they look from the previous photo. A second story has been added (although it may simply be a false facade), and many illuminated, ornamental decorations are evident. The other vaned structure at Center Top was a sandwiches and potatoes outlet probably themed to coincide with the Dutch Mill itself. Note the "Honey Dew" concession on this side of Lake Shore Boulevard and the many more light bulbs outlining all the structures. To the right is the carousel building. To its left is the entrance to The Dutch Mill attraction. Its vanes may be seen at Top Left. Some distance in front of the entrance have been added two lighthouse-like structures. In 1932, a fifth dance area opened after The Pavilion Restaurant, Sunnyside Bathing Pavilion, Palais Royale, and the open air dance pavilion near The Pavilion Restaurant. It was called The "Seabreeze". This was a large 2000 square-metre, open-air hall which featured a gently sloped dance floor to allow rain water to run off. 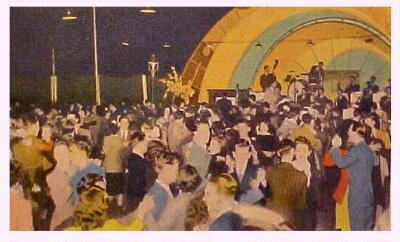 Over the years, two more dance halls would open at the park: The Slipper and The Palace Pier. Note the light standards at Upper Left, and their fixtures overhanging the dance floor at Center Top. The 1930s were lean times for the park, although money was spent in 1933 to modify The "Flyer", as discussed previously. Still, Torontonians needed some place to forget The Depression, so the park survived the decade. One place that did well was "Club Esquire" with its well-known Rhumba Room. The former Pavilion Restaurant was renovated in 1936 by William Beasley and run by him with international shows and revues booked, along with top orchestras. In 1939, the club was sold to Parklyn Holdings and renamed "Club Top Hat". It would continue until 1956 when it would be torn down as part of a new highway plan that would also see Sunnyside Park demolished. Note the signs on the roof at the left: "Gayest Spot in Town", and another above that advertising the club's Crystal Terrace, which faced the lake. 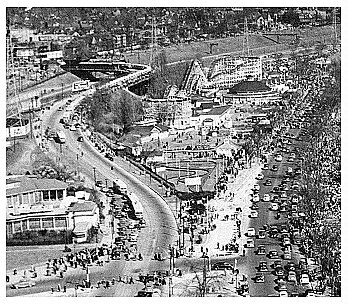 A boost occurred in 1941 with the military taking over the nearby Canadian National Exhibition grounds for six seasons, as mentioned previously. Without the fair's competition, Sunnyside was the only place for such recreation. As well, those military personnel would spend time at Sunnyside during their leaves. On Sundays during World War II, the TTC (Toronto Transportation Commission) did not charge servicemen in uniform to use their trams and ferries. The round building, near center in this view, housed the Carousel. To the right of it, part of The "Flyer" Roller Coaster is just visible. The busy street is Lake Shore Boulevard. One of the many park entrances along Lake Shore Boulevard. A refreshment stand is at center. To the right, at the tree line, is part of the Flyer coaster's structure. 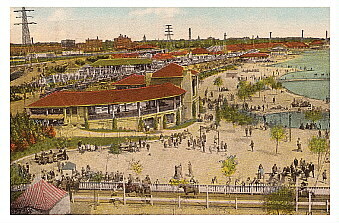 A busy day at the park is evident in this hand-tinted image. The sign at Center reads "Colonial Terrace". Performances were moved to the new Attractions Stage in 1945. The was located east of the old Merrymakers Stage on the lake side of the park. The free-admission community sing-alongs, which had started in 1938, continued to be run on this stage. The public followed the song lyrics by reading them from a large wooden book-like structure that was positioned behind and above the orchestra. It was hinged in the middle and an operator turned the "pages" to reveal each next set of lyrics in turn. From 1946 through 1955, the Art Hallman Orchestra entertained 8 to 9 PM every Sunday evening. Since virtually nothing else was open on Sundays at that time, this event was well attended by those wanting entertainment on that day. It was popular enough to have part of it broadcast on the radio, with the last half hour, sponsored by People's Credit Jewellers, going out over the airwaves throughout a large portion of Ontario. One of the masters of ceremony was Monty Hall, later to become famous in The United States as the host of the American television game show "Let's Make a Deal". The sing-alongs continued well after Sunnyside Park's demise. A crowd enjoys the performance and radio broadcast on a warm Sunday evening. The orchestra is likely Art Hallman's. At Stage Left (your right) may be seen a gentleman sitting at a table holding a large card or perhaps a script. He, or one of those seated behind him, may be the show's producer. On Stage Right (your left) about a dozen girls sit. They may be a chorus used to promote the audience to participate in the singing. Above and behind the piano player may be seen the "book" operator. Note down the center aisle a row of stands and microphones used to pick up the audience's voices and applause for the radio show. The house public address system consists of horn speakers on poles at extreme Center Left and Right. Another photo of these sing-alongs shows the audience and in the background may be seen the "Flyer" roller coaster. Also visible is a "Whip" sign, so this ride continued to be popular into the 1940s and may still be seen in photostaken late in that decade. The "Whip" was located just beyond the western end of the roller coaster. The girl in the front car has lost one of her balloons. It floats at the upper right. Note that the last car, partly obscured by that runaway balloon, has just rounded the curve and its controller mechanism is at full extension. 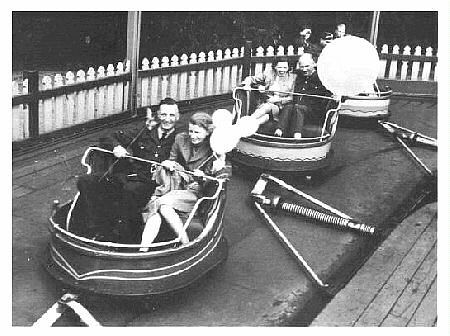 By the end of World War II, Sunnyside boasted a total of 14 adult rides, 6 kiddie rides, 24 games (still including "Guess-Your- Weight"), 18 refreshment stands, a funhouse, penny arcade, the shooting gallery, boat rentals, and the dance pavilion (which was a roller rink for part of the park's life), plus the swimming pools and the dance clubs. My directory source also shows a pony track, likely the "Poney" rides mentioned earlier. It was managed and/or owned by J.A. Hamilton. The park continued to add more rides and grow. By the late 1940s it had added a Bisch-Rocco "Flying Scooters", an Eyerly "Octopus" (16), a Hrubetz "Spitfire" (shown by one source as The "Aeroplane Swingaround"), and a Herschell "Looper" (designed by Norman Bartlett). Several photos show these and The "Auto Ride" entrance. A third aerial shot (below) shows the track layout which was an oval with an `S' curve indenting one side of the oval. Seen from left to right are The "Auto Ride" entrance (background), "Spitfire", "Looper" (background) and "Octopus". Once again, the now even-busier street is Lake Shore Boulevard. This early-season aerial photo was taken from the west end of the main amusement area of Sunnyside. It is bounded by Lake Shore Road on the left and Lake Shore Boulevard on the right. Easily visible are the Auto Ride layout at Center, the carousel building beyond that, and The Flyer coaster at Center Top. The increased height of the hills in this second version of the coaster is quite evident. Note the double-down seen just behind the carousel building. The building at the lower left is The Club Top Hat (formerly The Pavilion Restaurant and Club Esquire). Out of frame to the right are the beach area and more attractions. In this excellent higher-angle aerial shot, the season is over for Sunnyside but leaves still remain on the trees. Seen is The Flyer coaster. At its closest end are a Whip and concession buildings. In front are more concession buildings, the Flying Skooters and the carousel building. What may be a Tumble Bug lies beyond the coaster's first turn-around, and then The Derby Racer. Next to it the small building is a water pumping station. It still exists today. Opposite that near the water's edge is The Palais Royale. At the Upper Left is the Sunnyside rail station on Roncesvalles Avenue and the walkway down to the amusement area. Compare this photo to the 1926 aerial shot seen much farther back. 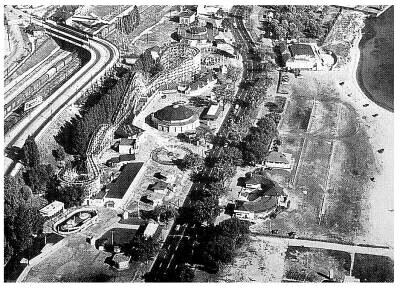 The biggest changes are the trees, the further land reclamation, and the altered coaster structure. Also around this time, was an attraction called "Spook Castle". This sounds like a haunted funhouse or walk-thru. 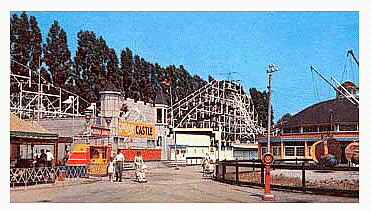 I have located a postcard image of it which is reproduced below courtesy of Ken Rutherford at Ken's Classic Coaster Postcards This attraction was located between the "Flyer" roller coaster and The "Flying Scooters", across from the carousel, and standing where The "Dutch Mill" had been. This was a different location from that of the earlier "Fun*Land", which had been farther east along the midway. Spook Castle" may simply have been part of the old Dutch Mill" building, but with a new facade and new interior theming. Another image (below) taken at a different time, shows that this was labelled simply as "Fun House". However, since it's a hand-tinted image, that "Fun House" sign may have been added and the "Spook Castle" turrets removed by the artist. By the early to mid 1950s, this attraction appears to have been replaced by a Herschell "Moon Rocket", as seen in the third image following. Seen at center right, is The "Flying Scooters", behind which is the carousel building. Just left of center is "Spook Castle", with the "Flyer" roller coaster running behind in front of the tree line. Note the weigh scale near the lower right. This is from a slightly different angle than the above photo. The same things appear, except that "Spook Castle" has its turrets removed and the sign has been changed to "Fun House". The weigh scale is now behind the light standard and next to the "Scooters" fence. In the center background, lights outline the carousel building's roof. Here is roughly the same view a number of years later. "Spook Castle" is gone and a Moon Rocket is in its place. Still seen are The Flying Scooters", carousel building and Flyer roller coaster. Its 1932 modifications are very evident in this view. In 1948, it had been recommended that since traffic congestion had become a major problem and safety hazard, the park's land was needed in order to push through a new expressway to relieve traffic in crowded Toronto. Part of the safety hazard was that the park was split by two major roads. Patrons had to cross and re-cross these roads at grade to reach the rest of the park or other attractions in the area. All concession owners were eventually put on year-to-year leases, which were not renewed after the 1955 season. The tender for demolition was put out in November of that year and awarded to Kepic Brothers of Brantford, Ontario for the sum of $335. 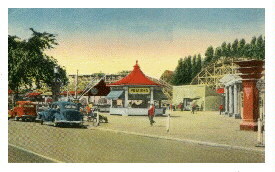 They demolished the park in late 1955 and early 1956, with only a few rides and some buildings being saved. The latter included the Bathing Pavilion and the bandshell where the sing-alongs continued at least until 1963, as confirmed by an advertisement. One ride preserved was the carousel which went to Disneyland in California (in 1954 ?). It was refurbished there and modified to a 4-row unit by using animals from other carousels such as from Carmel, Loof, and Stein & Goldstein. The new version was named "King Arthur's Carousel" and supposedly opened with the park in 1955. It now contains some fibreglass replicas. Another, The "Derby Racer", went to The Canadian National Exhibition where it ran for several decades. At one point some of the horse movement mechanism was removed, but it remained at The CNE until sold in pieces sometime in the early 1980s. I assume that the remaining flat rides were removed by their owners and sold or set up elsewhere. Highway construction on the Sunnyside property began in the spring of 1956. An item of note occurring late in the park's existence is that 16-year old Marilyn Bell came ashore near The Boulevard Club after her famous lake swim in 1954. The site is now called "Marilyn Bell Park" in her honour. See Boblo Island, for more on the event. In 1975, the Bathing Pavilion was deemed a historical site. It was restored and rededicated June 14, 1980 and may still be seen today. Sunnyside's open period ran from roughly the Victoria Day (third Monday in May) Weekend through Labour Day (first Monday in September). 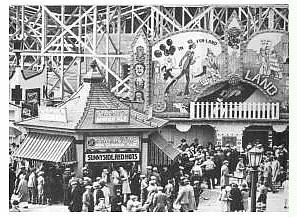 There were some early season openings and late season closings, by some concessionaires, as is evidenced by one sign on a refreshment stand stating in part "Sunnyside Amusement Beach Open during (unreadable) October". It should be recognised though, that the park was not open on Sundays (save for the community sing-alongs) - and in fact was completely shut down by midnight Saturday night. It also never served alcohol. Notice in the date field at the start of this write-up, that "1956" is given. 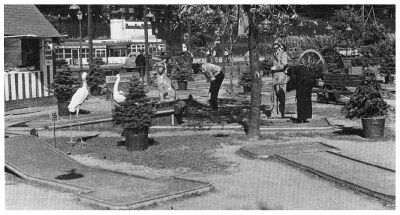 This is because although the park closed after the 1955 season and was gone by the following spring, Conklin Shows ran a kiddie land on a portion of the Sunnyside site for the 1956 summer. It was not part of Sunnyside Park proper, but should be noted. 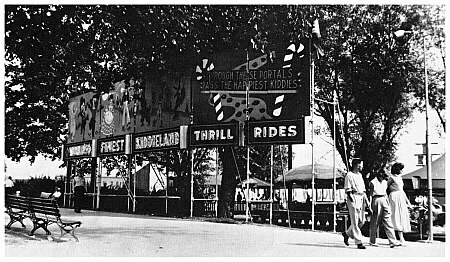 The lower signs read: "World's Finest Kiddieland", and "Thrill Rides". The upper sign: "Through These Portals Pass the Happiest Kiddies". I'd like to credit Toronto historian Mike Filey, as a major source of information for this article. Thanks to Brian Westhouse of Rexdale, Ontario for the "Gad-a-Bout" photo. Appreciation goes to Ben Fullerton of Fletcher's Lake, Nova Scotia, and Paul Lindsay and Colin Conrad of Dartmouth, Nova Scotia for postcard scan work.